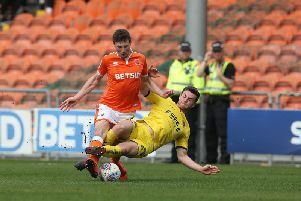 He can normally be found racing around a football pitch but Ash Hunter is making the switch behind the scenes to sell tickets for Saturday’s derby clash at Blackpool. And he hailed the Cod Army for their role in helping Fleetwood clinch League One survival by winning five of their last six games. Hunter, Kyle Dempsey and Wes Burns will be in the club shop from 5-6pm this evening to sell tickets for the Bloomfield Road match. It is your chance to chat to the young trio, who will also be selling away shirts at a clearance price of £10 – Town are set to don this blue strip for the last time against their neighbours this weekend. Hunter and Dempsey have been key figures in helping steer John Sheridan’s men to League One safety and both started at Oxford on Tuesday, when Conor McAleny’s stoppage-time strike lifted Town to 11th with 54 points . Burns is expected to get more minutes in the final four games as Sheridan assesses his whole squad. Hunter hailed the fans and said: “They have been great again this season. The club shop will remain open until 7pm tonight, and ticket office and retail manager Steve Metcalf said: “It’s great that the lads are coming down just 48 hours ahead of the big game. Fleetwood goalkeeper Alex Cairns has been nominated for the March PFA Player of the Month award. Cairns, who conceded only one goal in five League One matches last month, has played a key role in John Sheridan’s side climbing into the top half of the table and clear of relegation danger. The 25-year-old is up against Nick Powell (Wigan), Brett Pitman (Portsmouth), Bradley Dack, Adam Armstrong (both Blackburn) and Jack Marriott (Peterborough) for the award.